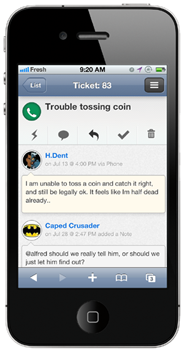 Social customer service platform Freshdesk is bringing its help desk solution to mobile devices. The company’s new FreshMobile HTML5 mobile app enables supports teams to manage their help desk from both iOS and Android devices. The FreshMobile app from Freshdesk allows support agents to create, save and reuse templates for replying to tickets - really useful as typing on a mobile device can be excruciatingly painful. Perhaps most unique in the FreshMobile app is the Solution Suggest feature, which suggests likely solutions from a client’s knowledge base.